Dorzolamide HCl is indicated for use in the treatment of glaucoma (increased ocular pressure). Elevated intraocular pressure is a major risk factor in the development of optic nerve damage and glaucomatous visual field loss. Dorzolamide HCl requires a prescription from your veterinarian. Dorzolamide HCl inhibits carbonic anhydrase II. Inhibition of carbonic anhydrase decreases aqueous humor secretion, presumably by slowing the formation of bicarbonate ions with subsequent reduction in sodium and fluid transport. The result is a reduction in intraocular pressure (IOP). Disclose all medications you are giving to your pet to your veterinarian. If any side effects occur (swelling, hives, difficulty breathing), stop using Dorzolamide HCl on your pet and contact your veterinarian. Do not touch the dropper to any surface, including the eyes and hands. If it becomes contaminated, it could cause an infection in the eye. Dorzolamide HCL is not FDA approved for use in veterinary medicine; however, it is a commonly accepted practice for veterinarians to use this product in dogs and cats. 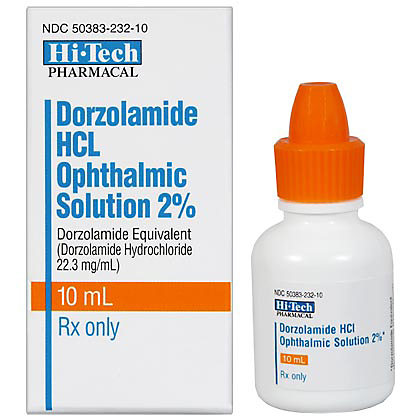 Dorzolamide HCl is available by prescription as a 2% solution in a 10ml sterile ophthalmic dispenser. The usual dose of Dorzolamide HCl is 1 drop in the eye 3 times a day. Do not touch the dropper to any surface, including the eyes and hands. If it becomes contaminated, it could cause an infection in the eye. Dorzolamide HCl may cause blurred vision. Dorzolamide HCl is a carbonic anhydrase inhibitor used to reduce pressure inside the eye by reducing the amount of fluid in the eye. Dorzolamide HCl is used to treat high blood pressure in the eye due to open-angle glaucoma. Dorzolamide HCl may also be used for purposes other than those listed in this guide. Tell your veterinarian if your pet has ever had an allergic reaction to a sulfa based drug such as SMZ/TMP (bactrim, Septra), sulfisoxazole, sulfamethoxazole, or sulfacetamide sodium (Bleph-10), Sulamyd Sodium). Dorzolamide HCl is based on a sulfa compound and your pet may have an allergic reaction to it. Tell your veterinarian if your pet has kidney or liver disease. Tell your veterinarian if your pet is pregnant, lactating, or if you intend to breed your pet. Use Dorzolamide HCl exactly as directed by your veterinarian. If you do not understand these directions, ask your pharmacist or veterinarian to explain them to you. Always wash your hands before and after applying this medication. Apply the medication to the pets eye by pushing on the "Finger Push Area" of the bottle which then releases a single drop of the medication. If you are using another eye drop in your pet, wait 10 minutes between use of different medications. Do not touch the dropper to any surface, including the eyes and hands. If it becomes contaminated, it could cause an infection in the eye. Do not use if the eyedrop is discolored or has particles in it. Store Dorzolamide HCl at room temperature away from moisture and heat. Protect from light. Keep the bottle properly capped. Symptoms of Dorzolamide HCl overdose are not known but may include panting, diarrhea, vomiting and loss of appetite which can occur when using oral carbonic anhydrase inhibitors. If an overdose is suspected, flush the eye with water and call your veterinarian or veterinary emergency room. Dorzolamide HCl may cause blurred vision. Do not touch the dropper to any surface, including the eyes and hands. If it becomes contaminated, it could cause an infection in the eye. If you are using another eye drop in your pet, wait 10 minutes between use of different medications. If any of the following serious side effects occur, stop using this Dorzolamide HCl and seek emergency veterinary medical attention; an allergic reaction (swelling of the lips, face, or tongue; difficulty breathing; closing of the throat; or hives). Less serious side effects may be more likely to occur. Continue to use Dorzolamide HCl and contact your veterinarian if your pet experiences itching or watering of the eye; blurred vision; sensitivity of the eye to sunlight; fatigue; rash; or nausea. Side effects other than those listed here may also occur. Talk to your veterinarian about any side effect that seems unusual or bothersome to the animal. Tell your veterinarian if your pet is being given an oral carbonic anhydrase inhibitor such as acetazolamide (Diamox), dichlorphenamide (Daranide), or methazolamide (Neptazane). Avoid applying other topical medications at the same time unless told to by the veterinarian. Other topical medications may affect the absorption or effectiveness of Dorzolamide HCl. Drugs other than those listed may also interact with Trusopt. Talk to your veterinarian or pharmacist before giving any prescription or over the counter medications, including vitamins, minerals, and herbal products. Your pharmacist has additional information about Dorzolamide HCl for health professionals that you may read. Dorzolamide HCl Sterile Ophthalmic Solution is a prescription medication used in dogs and cats to reduce pressure inside the eye by reducing the amount of fluid in the eye. Dorzolamide HCl Sterile Ophthalmic Solution is also used to treat high blood pressure in the eye due to open-angle glaucoma. Dorzolamide HCl Sterile Ophthalmic Solution is a prescription medication not FDA approved for veterinary use; however, it is a commonly accepted practice for veterinarians to prescribe this medication for dogs and cats. Do not touch the dropper to any surface, including eyes and hands. The dropper is sterile. If it becomes contaminated, it could cause an infection of the eye. Do not use if the eye drop is discolored or has particles in it. Dorzolamide HCl Sterile Ophthalmic Solution may cause blurred vision. Store Dorzolamide HCl Sterile Ophthalmic Solution at room temperature away from moisture and heat. Keep the bottle properly capped. Other Ingredients: Hydroxyethyl Cellulose, mannitol, sodium citrate dihydrate, sodium hydroxide (to adjust pH) and water for injection.